Whether you're new to Windows or you've used it for many versions, there's always something new to find out about Windows 10! So, it's quite possible that at some point, you'll have a question, or face an issue, or just want to know more about how to use Windows like an expert. Where do you find answers? 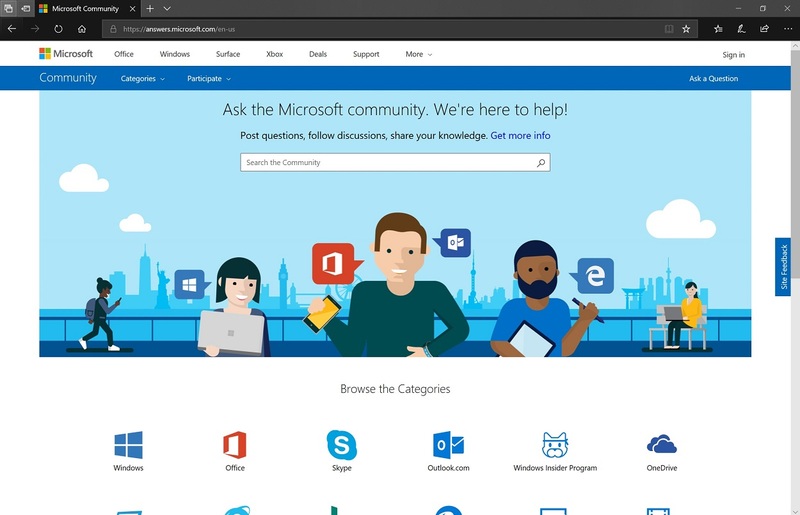 Of course, there is the support website at Microsoft Support, but you can also find help with the Get Help app built right in to Windows 10, the Microsoft Answers community, and even in-person consultations at Microsoft Stores! The new Get Help app is part of the Windows 10 Fall Creators Update, the newest feature update to Windows. 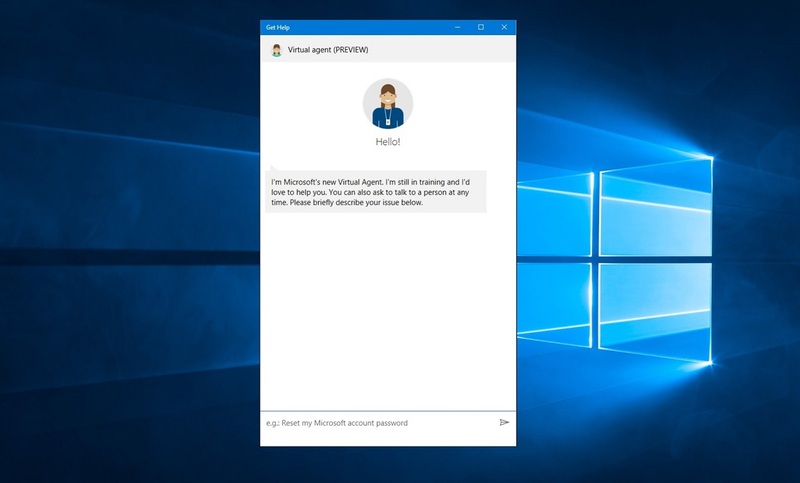 In the United States version of Windows, Get Help even offers a Virtual Agent built right into Windows. What is a "virtual agent"? It's new "artificial intelligence" technology that's like having an automated support technician right in Windows, who you can ask for the solutions you need. This is a great first step to take to get answers, as it is the quickest and most accessible support option. You don’t have to wait in a queue, or search through support articles to find what you are looking for. Note: The virtual agent is under preview, which means the more it's used, the better and more accurate it gets. But it also means if you don’t get the right answer the first time, try rephrasing your question. That helps the technology learn. To get started using the Get Help application, open it from the Start menu, or find it from Windows Search by typing "get help". Once the application is open, type a simple description of your issue in the text box, such as “change my background”. This description does not have to be complex, it can be just four or five words. Depending on what you need help with, the virtual agent will offer different suggestions that would potentially help. 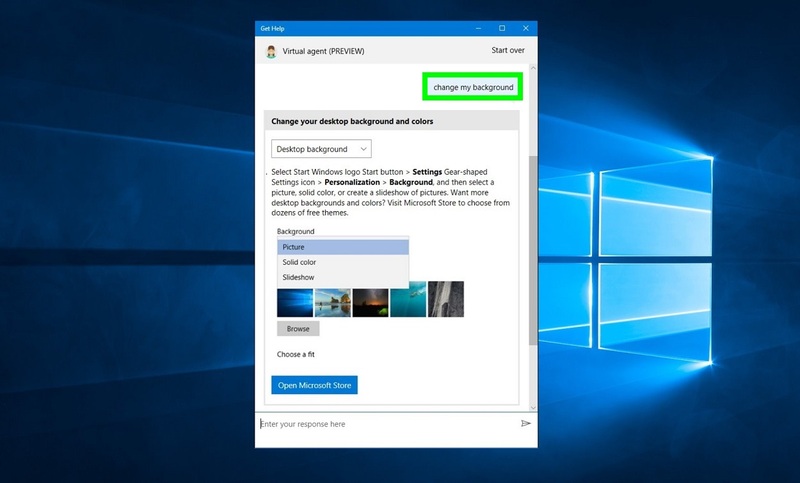 In the example above, the virtual agent provided me with steps I can take to reset my Windows background. Some other suggestions might include links to articles that might solve your issue, or troubleshooting steps. 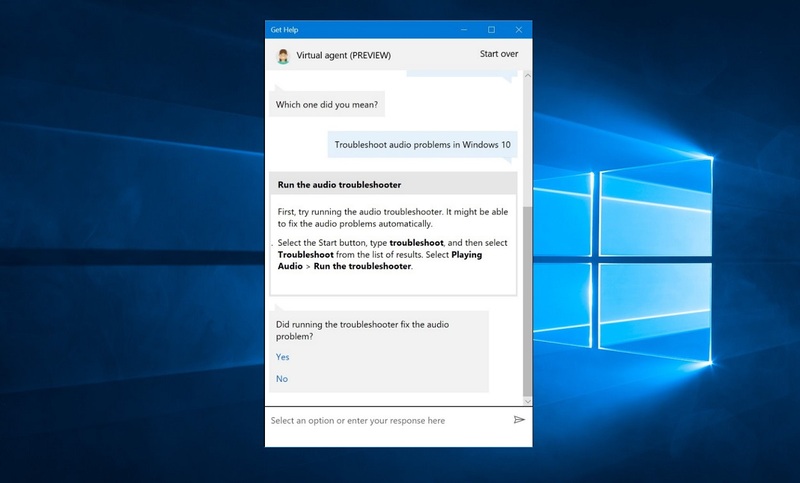 In this example, I entered “my sound is not working” as the issue – the virtual agent asked for clarification, in order to find the correct solution to my issue. Once you select the option most applicable to your problem, the assistant will give you some next steps to follow. If you have access to a Microsoft Store, they are about more than just buying some of the latest technology available. They also provide access to product experts that can help teach you more about Windows. Microsoft Stores offer workshops, Personal Trainings and other technical services to help guide you along your Windows 10 experience. Each Microsoft Store, except for specialty stores, has an Answer Desk, which helps with questions or troubleshooting for technical issues. When you’re in a learning mode, Stores frequently also have free events on many subjects, and personal training available. The Answer Desk will help with walk-in questions, if an expert is available, but that and the personal training opportunities work better if you can schedule an appointment. 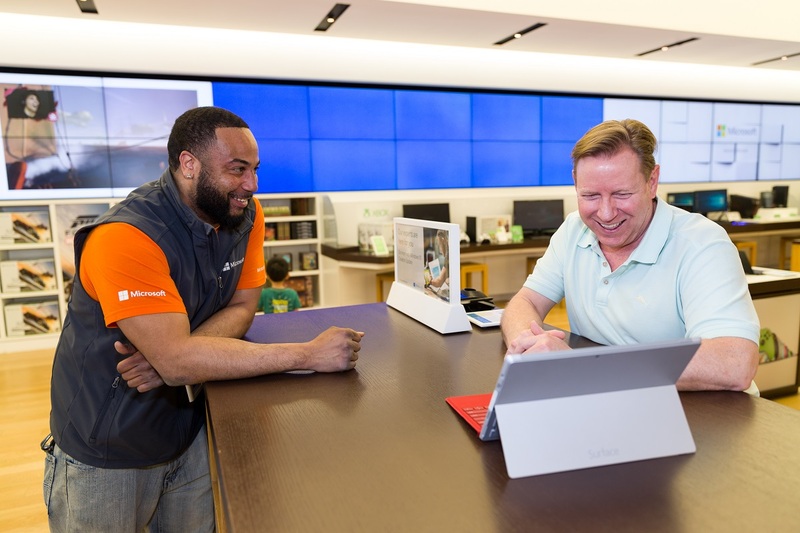 Go to the Microsoft Store website to schedule an in-store appointment or find out when events are planned in the Store you prefer. Sometimes more experienced Windows users might have your answer. Find such Windows experts in the Microsoft Answers Community! This is a website where Windows users get together to help reveal some more hidden features through forum articles, or to ask (and solve together) specific problems they may be experiencing. Microsoft staff, MVP, and support engineers are all frequent expert contributors to Answers Community and will pitch in, alongside other users, to help troubleshoot some of the more difficult issues. To get started, head over to the Microsoft Answers community! Once you are on the website, you can search for any articles relating to a feature or issue you may want to learn more about. Community members will frequently create Questions, Discussions or Forum Articles that may relate to your specific case. Questions are submitted by users on the Microsoft Answers community and can be answered by other members, Windows Insiders or even Microsoft Engineers! If the issue is common, chances are your question has already been answered. It might be easiest for you to search for your question or problem and see if there's an answer already waiting for you. If you have an opinion about Windows 10 you would like to share, or if you want to share your own expertise with other community members, start a Discussion! Discussions are a great way to engage with the community of Windows users by sharing your thoughts and ideas for Windows 10. Forum Articles are created by Forum Article Authors to help teach others more about Windows. They can span from subjects such as “How to find out what version of Windows you are using”, to much more technical levels, such as “How to use Windows 10's built-in Hyper-V for creating Virtual Machines”. Whatever the level of information you need, getting help has never been easier with Windows 10. 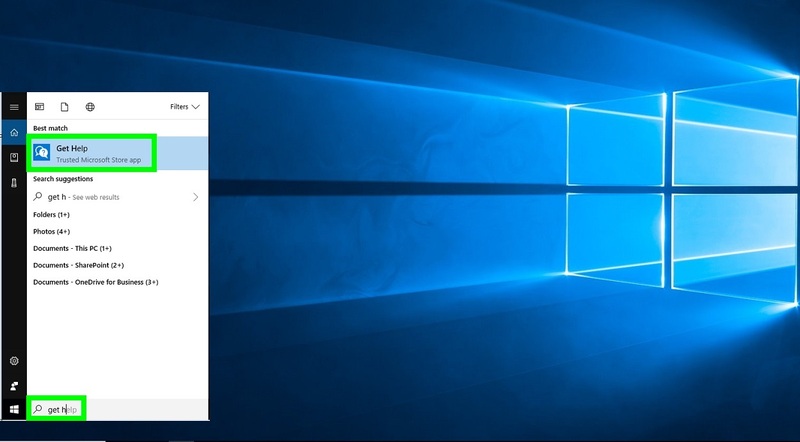 Have a question or are wondering how to do something with Windows 10? Give one of these options a shot!